Orlando and the rest of Florida is full of unforgettable attractions and sights. To help visitors make the most of their stay in the Orlando area, we offer sightseeing tours to a number of famous statewide destinations. All of the tours are day trips and are inclusive of pickup and drop off services from selected points along International Drive, Lake Buena Vista and Kissimmee hotel areas. In addition to a clean and comfortable ride, guests will be greeted by a friendly multilingual tour guide who will provide informative narration during the extent of the trip. Dependent on the tour, we also include entrance fees and scheduling for various experiences at your destination. Currently, some of our sightseeing tours include the Kennedy Space Center, Miami Beach, Clearwater Beach and other interesting destinations! Your trip will be an unforgettable experiences for the whole family. Popular choices include the Dolphin Encounter, Sealife Safari, Chef Mickey Character Dinner and more. Water lovers will enjoy the extensive choice of boat cruises, which take advantage of the nearby Atlantic Ocean. Speed Boat, Sail Boat, Island Shelling and Deep Sea Fishing cruises are all available with ground transportation from Orlando Sanford Taxi. Several different options are available for most destinations and experiences to suit a wide range of budgets. Prices include ground transportation to and from selected locations, with discount rates for children. Orlando sightseeing tours to Kennedy Space Center, Clearwater Beach, sea cruises, shopping, guided tours to the Florida everglades and more. All our Kennedy Space tours include roundtrip transportation from central pickup points on International Drive, Lake Buena Visa and Highway 192 in Kissimmee. Monday, Thursday 2 Kennedy Space Center & Airboat Safari: Includes round trip transportation, guided tour through the KSC complex, unlimited access into the KSC plus 40 minute airboat ride safari. Daily 3 Kennedy Up Close Explore Tour: Astronaut meet/greet upon arrival at KSC and a highlights tour of the Space Shuttle Atlantis. The best tour for the Ultimate Space fan-includes a maximum access badge, Lunch with an Astronaut voucher and a NASA upclose tour all in one. Daily 4 Dine with the Astronauts at Kennedy Space Center: Included in your visit to KSC is a buffet style lunch with the Astronaut and a Maximum Access Admission Badge-"Something New Not to Be Missed!! Sightseeing tours from Orlando to Miami Beach., Clearwater Beach and St. Augustine. Our scheduled excursions include Miami Beach's art deco district (South Beach). St. Augustine Old Town Trolley stops at 22 remarkable landmarks throughout the USA's oldest city. Enjoy a relaxing day working on your tan on the gulf of Mexico by hopping on our Clearwater Beach shuttle bus. St. Augustine Old Town Trolley and Clearwater Beach Jolly Trolley are the ways to enjoy these coastal cities. Thursday, Sunday 5 Everglades - Miami Adventure: Experience time in the Bayside Marketplace Park you will enjoy the Star Island Boat Ride, next it is off the Everglades Park where you will experience a crazy airboat ride and participate in a alligator and snake handing show. We end the day in South Beach for free time in this hotspot. Breakfast Bag included. Thursday, Sunday 6 One Day Miami Tour : View this spectacular city! Time to shop around Bayside Marketplace. Optional Star Island cruise to see where the rich and famous live. Spend the afternoon on world famous South Beach. Breakfast Bag included. Wednesday 6A Miami South Beach Overnight Getaway: Come visit the American Riviera - South Beach, Miami! Home to beautiful Art Deco architecture, white sand beaches, and a thriving nightlife, South Beach is the ultimate vacation destination for those looking to enjoy some sun, shopping, and celebrating! Wednesday, Sunday 7 City Tour of Orlando: We visit the Lake Eola district of Downtown Orlando, then it's over to Winter Park,where we include a scenic boat ride and some free time at exclusive Park Avenue. Final stop is town of Celebration. 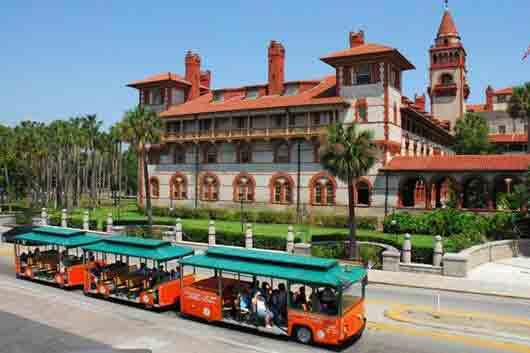 Monday, Thursday 14A St. Augustine Day Trip WIth Road Train Tour: Explore Saint Augustine on an open air trolley! This fun little hop-on, hop-off train meanders through cobblestone streets as the driver points out all the landmarks in storybook fashion. Monday, Thursday 14B St. Augustine With Scenic Boat Cruise: View Saint Augustine from the water on a sightseeing tour boat. See the fort, lighthouse, the Bridge of Lions and much more on this 75 minute narrated boat tour. The remainder of time in Saint Augustine is yours to wander the cobblestone streets and enjoy of America's oldest cities. Tuesday, Friday 16 The Dolphin Encounter: Includes round trip transportation and a 75 minute cruise to spot dolphins in the Gulf of Mexico,inclusive of beer, wine and soda during boat cruise. Tuesday, Friday 17A Captain Memo's Pirate Cruise: Includes round trip transportation and a 2 hour pirate boat cruise. Tuesday, Friday 17B Winter the Dolphin Experience Tours From Orlando: Spend a day at the Clearwater Marine Aquarium where you will have a chance to meet the aquarium's most famous resident - Winter the Dolphin and free time at the beach. Friday November 19 - December 26, 2016 27 Nights of Lights Celebration: Includes transportation to St. Augustine's with free time to enjoy this festive town. A 25 minute trolley tour provided by Old Town Trolleys is also included to see the wonderful display of lights that this town puts up during their annual celebration. Our Orlando Eco Tours will allow to see wildlife up close. 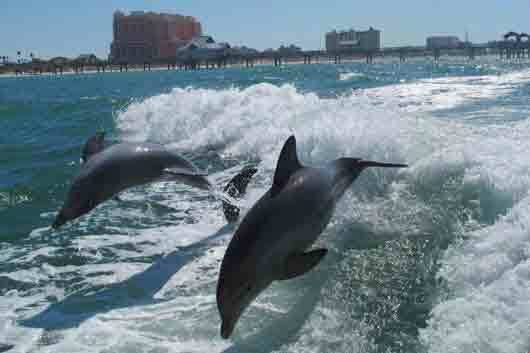 You can swim with dolphins or manatees, glide by alligators or do some deep sea fishing on our scheduled excursions. Our Eco tours allow you to get up close to dolphins, alligators and some other native Floridian's. Tuesday, Friday 15 Gatorland: Includes round trip transportation and admission. This park is geared towards education, entertainment and offers a variety of shows. Tuesday, Friday 15A Gatorland Sightseeing & Airboat Tour: Imagine gliding thru the grassy marsh of the St. Johns River at speeds of up to 45 M.P.H. & visiting Gatorland the world's largest alligator park in the world. Tuesday, Friday 19 Deep Sea Fishing: Includes round trip transportation and a 4-hour deep-sea fishing cruise in the Gulf of Mexico. Rods, bait, tackle and license included. Monday, Thursday 20 Monster Truck Adventure: This educational eco-tour takes place on a 2,500 acre working cattle and citrus ranch. You'll be riding 12 feet on the world's largest 4X4 Monster Truck. Saturday 20B Western Rodeo Adventure: This Western Rodeo adventure takes you for a taste of the ranch with a night including a barbeque, a hayride, world-class rodeo, and line dancing! Saturday 22 Swim Where the Manatees Live:: Enjoy a leisurely narrated boat ride on the Crystal River, swim and snorkel with manatees (mask, snorkel and fins included). Then, enjoy a basket style hot lunch in a riverside pub and restaurant. To end your day, you'll visit Homosassa State Wildlife Park, famous throughout Florida for the rehabilitation of injured animals. You'll also see bears, panthers, alligators and even a hippo as you explore the rest of the park. Daily Except Sunday 23 Airboat Ride & Transport:: This 1/2 day tour takes you along to one of Central Florida's most popular airboat farms,where you gt to experience the wind in your hair while getting in touch with your wild side! Includes airboat ride and roundtrip transportation. 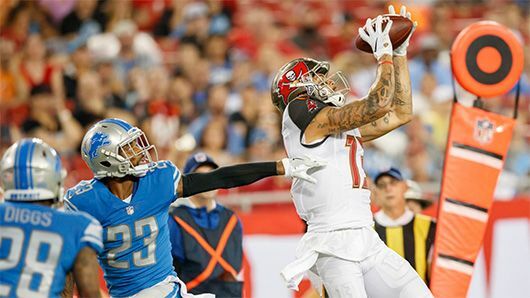 Going to a Tampa Bay Buccaneers football or if you want to see a race at Daytona, hop on our sports tour busses and avoid all the traffic nightmares. Ticket and transportation options available. Looking to watch a live NFL football game or the Daytona 500? We provide ticket and transportation packages to these events. This tour is seasonal and only operates from August to December. You'll be at the game early, so you can enjoy all the pre-show entertainment. February 17, 2019 NASCAR DAYTONA 500 STANDARD PACKAGE: Includes roundtrip transportation to the Daytona International Speedway and excellent seats in the new seating area, Daytona Rising, Section number 174, rows 1-10. NASCAR DAYTONA 500 FANZONE PACKAGE: Includes roundtrip transportation to the Daytona International Speedway and excellent seats in the new seating area, Daytona Rising, Section number 174, rows 1-10 and entrance to the Pre-race Sprint FANZONE. July 6, 2019 NASCAR COKE ZERO 400 STANDARD PACKAGE: Includes round-trip transportation and seats in rows 1 - 10 of sections 180 - 184. NASCAR COKE ZERO 400 FAN ZONE PACKAGE: Includes round-trip transportation and seats in rows 1 - 10 of sections 180 - 184 and entrance to Sprint Fanzone. NASCAR COKE ZERO 400 WITH UPGRADED SEATS AND FAN ZONE PACKAGE: Includes round-trip transportation and seats in rows 25-38 of sections 133-139, or 153-159 and entrance to Sprint Fanzone. Seats are near the start/finish line! Our dining excursions include Character Dining with Chef Mickey and Planet Hollywood include transport in a limousine. On Sunday's enjoy a Gospel brunch after an Orlando city tour. Make a Disney character breakfast or dinner part of the things to do for your family. Sunday 8 Gospel Brunch and City Tour of Orlando: Everything included in tour 9 + Gospel Brunch at House of Blues around lunch time. Tuesday, Wednesday, Thursday 10 Disney Character Breakfast: Tour includes round trip transportation via Limousine from the guest's hotel to the Disney Grand Floridian Hotel. All you can eat Disney buffet breakfast in the presence of Disney Characters - Mary Poppins and friends - usually Alice and the Mad Hatter. Each table will get a chance for photographs and autographs from the characters. Per Disney - characters can be subject to change! 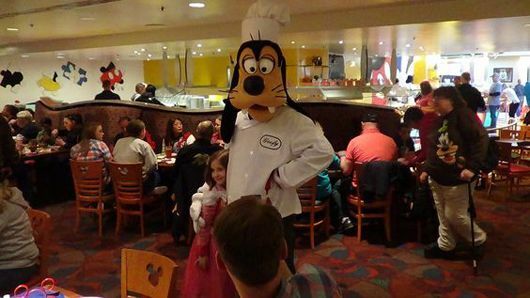 Tuesday, Wednesday, Thursday Evening 10A Disney Character Dinner at Chef Mickey: If you ever wanted to dine with the stars,then this is your opportunity - and the stars don't get much bigger in Orlando than Mickey Mouse, Donald Duck, Pluto and Chip and Dale. Tuesday, Wednesday, Thursday 10B VIP Planet Hollywood: Arrive in style at the world famous Planet Hollywood restaurant in Downtown Disney. Door to door service is included in your own stretch limousine. 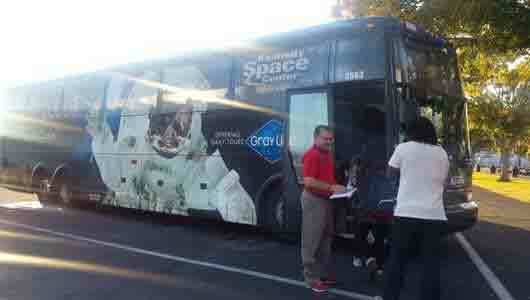 If you have a group of 10 or more for any Orlando sightseeing tour email us with your special request. We will confirm all bookings via E-mail.